We are the leading manufacturer of Coupled Stirring Device and our product is made of good quality. 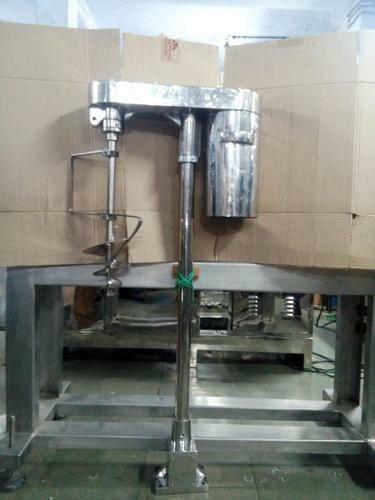 We offer Coupled Stirring Device with a jacketed hopper that is sturdy and compact in design along with simple in operation. l in order to ensure the durability of the finished product. These are available in various technical specifications to present a range of options to the clients. Moreover, we provide customized solutions as per the client’s requirements in order to meet their specific industrial needs. Established in the year 2000, we, "Rahul Enterprises", are the foremost manufacturer and supplier of an extensive range of Industrial Machines. Our wide collection of products comprises of Tube Filling Machine, Cream Filling Machine and Ointment Filling Machine. Our range of precisely engineered products delivers superior performance and finds application in for pharmaceutical and cosmetic industry. The offered range is designed and fabricated using high grade raw material and other allied materials under the supervision of our well-versed engineers. Furthermore, we make use of the most advanced technology in order to manufacture these products in complete compliance with international quality standards. In addition to this, we offer our range to our esteemed clients at highly competitive prices. We have set up all the required facilities at our manufacturing unit that helps us undertake bulk orders of our clients. In order to fabricate this finest quality range of products, we have established our state-of-the-art infrastructural base that sprawls over a wide area of land. These departments are well-resourced with the most advanced machinery and cutting-edge technologies that are required to fabricate these quality-assured products. In addition to this, these high-tech machines are efficiently operated by our highly skilled and competent team of professionals in order to carry out the best output. These professionals efficiently use the available resources that also help us in offering the qualitative range of products.